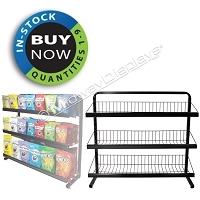 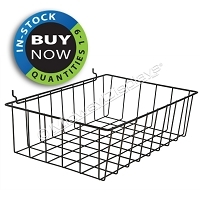 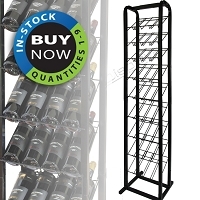 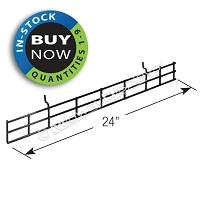 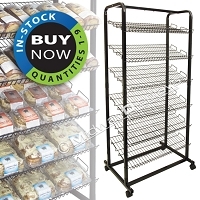 In-Stock Retail Metal Wire Racks | Full-View® Merchandising | Made in the USA | Midway Displays, Inc. 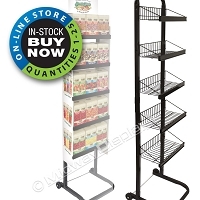 Floor & Counter Full-View® Merchandisers for immediate sale in small quantities. 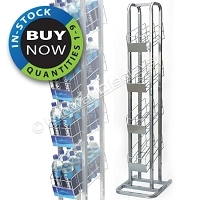 Midway Displays unique wire display racks, Full-View® Merchandisers design allows you to customize a stationary display rack by utilizing standard metal rack frame component parts without the traditional lead times for custom parts. 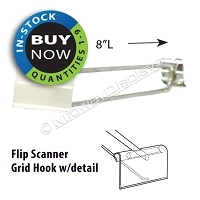 We selected two of our best selling combinations for our on-line store, our 4-tier hook merchandiser utilizing 4 universal hook bars with 16 wire grid hooks that include scanner tags to individually price or apply UPC codes to each individually pegged product. 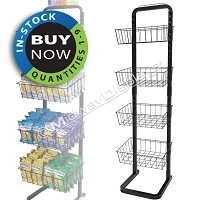 A favorite in the salty snacks and sweets category. 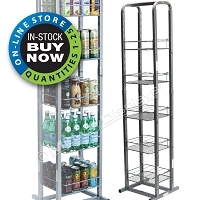 We also offer our 4-tier wire shelf merchandiser, with shelves that are fully adjustable to create your desired height of each shelf based on your package heights. 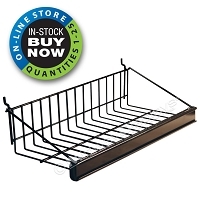 Your products have great shelf presentation on this easily assembled portable metal wire floor stand. 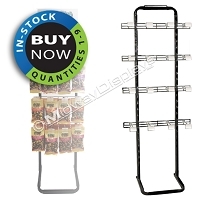 You can further customize these off the shelf racks, by adding additional hook bars, hooks and shelf components, offered in our on-line store. 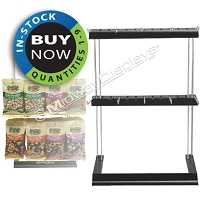 These components can be mixed and matched to create a combination presentation of both shelves and hanging product all on the same Full-View® Merchandiser. 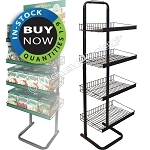 This component system allows you to display hanging, shelved or prepacked cartons of product on a single floor rack. 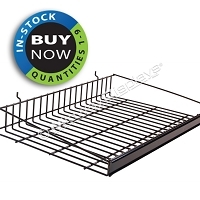 A modular wire rack that knocks down and sets up quickly.